Get your pair before all the “HYPEBEASTS” do! Come out and celebrate DJ SPONTANE’S birthday on Friday, April 6, 2012 @ SAVOY NIGHTCLUB. Whoever came out last year and thought it was crazy…..well this year it’s gonna be even crazier! There are several invited celebrity guests…..so you don’t want to miss out. What do you think of these Nike Air Foamposite One Customs with the Penny image on them? 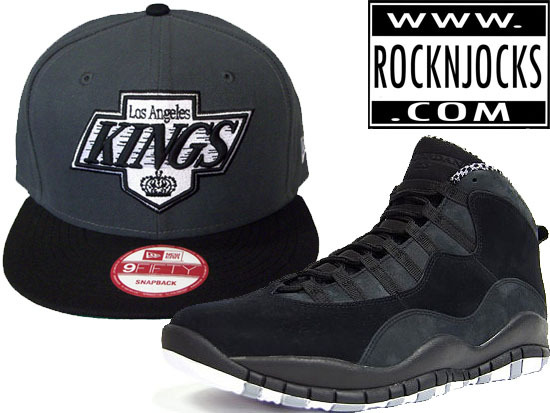 Rock-N-Jocks has got the perfect match for the Retro Jordan 10’s that just dropped with this custom Los Angeles Kings snapback New Era. This snapback is all graphite grey with the top of the bill in black and the bottom of the bill in green. The embroidered Los Angeles Kings shield logo on the front of the hat is in white and black. The back of the hat has the same kings embroidered shield logo but smaller in white and black. Limited to only 30 total pieces. Go make it yours before it sells out only at www.rocknjocks.com. Nike Air Yeezy 2 – Release Rescheduled For June 2012??? Words are now that after the postponement of the Nike Air Yeezy 2 April release is that it has been officially rescheduled for a June 2012 release. What are your feelings? The NCAA Men’s Tournament Final Four is set! 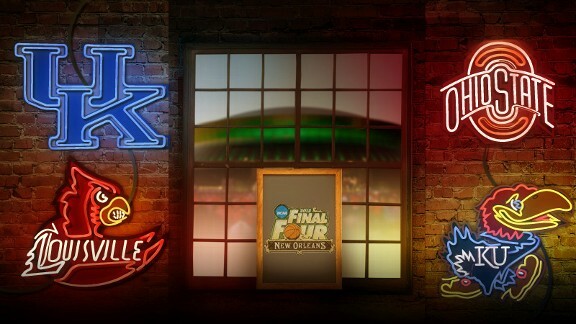 Louisville will play Kentucky and Kansas will play Ohio St. Who do you have winning the title? Hot Pink and crisp Aqua Blue has been a staple of the Miami ‘aura’ for decades, but credit the LeBron 8 ‘South Beach’ for revitalizing that Retro-themed vibe in the current generation of advanced color palettes. Since the advent of Nike’s South Beach, there have been a plethora of attempts to recreate that energy by way of custom sneakers, apparel, and other endeavors that admittedly fell short of the South Beach hype, so how does this upcoming Nike LeBron 9 P.S. Elite fare? We first showed you detailed angles of these a few days ago, and while the ‘South Beach’ theme is rather apparent, these could very well be called the ‘McFly’ for its stark resemblance to the unreleased Nike Hypermax ‘McFly’. In any case, these are bound to be major hits once they hit stores in the coming months, so peep these new images below and stay tuned for more updates. 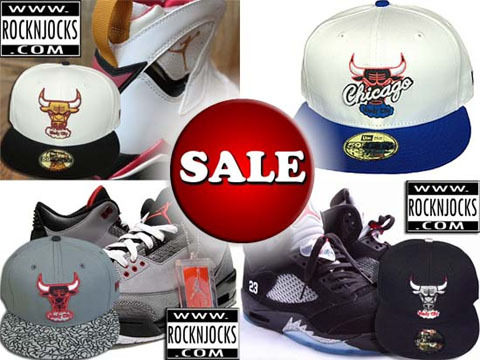 Rock-N-Jocks is having a Huge blowout sale with these four custom Chicago Bulls New Era 59/50 fitteds. Get these as cheap as $17.99. Get the perfect match for you retro Jordan Cardinals, Stealths, and Retro fives at amazing prices. Hurry the inventory on these hats won’t last long at these prices. Only at www.rocknjocks.com. Also you have to click RNJ’s facebook like button if you want huge discount codes for future orders at http://www.facebook.com/pages/Rocknjocks/181017275271403. Nike Air Yeezy 2 – Release Postponed? At this point, any change in the release info for Kanye’s next shoe shouldn’t come as a surprise, so this recent news from Solebox of a globally postponed release surfacing from out of Europe could be just another bump in the rocky road of the Nike Air Yeezy 2. The final destination sure looks worth it, but it looks like sneakerheads may have a wait a bit longer to get their hands on theirs. Do those that have been camping out since late-February have more time to enjoy the outdoors? Nothing seems to be officially confirmed by Nike at this point, but stay tuned and we’ll be sure to keep you up to date on further Air Yeezy 2 release developments very soon. The first No. 1 seed in the NCAA Tournament to get eliminated is Michigan St. The first time in history that a No. 1 seed loses and scored less than 50 points. 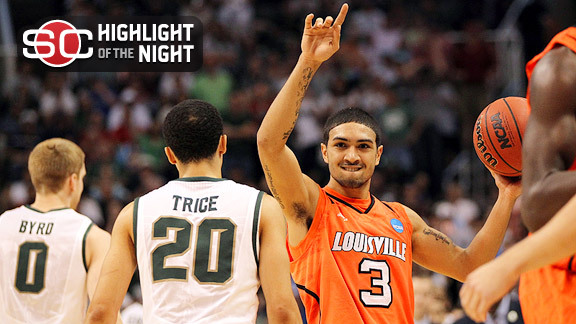 Louisville defeated Michigan St. 57-44.